Browser security prevents a web page from making AJAX requests to another domain. This restriction is called the same-origin policy, and prevents a malicious site from reading sensitive data from another site. However, sometimes you might want to let other sites call your web API. This tutorial demonstrates CORS support in ASP.NET Web API. We'll start by creating two ASP.NET projects – one called "WebService", which hosts a Web API controller, and the other called "WebClient", which calls WebService. Because the two applications are hosted at different domains, an AJAX request from WebClient to WebService is a cross-origin request. Internet Explorer does not consider the port when comparing origins. This section assumes you already know how to create Web API projects. If not, see Getting Started with ASP.NET Web API. Start Visual Studio and create a new ASP.NET Web Application (.NET Framework) project. 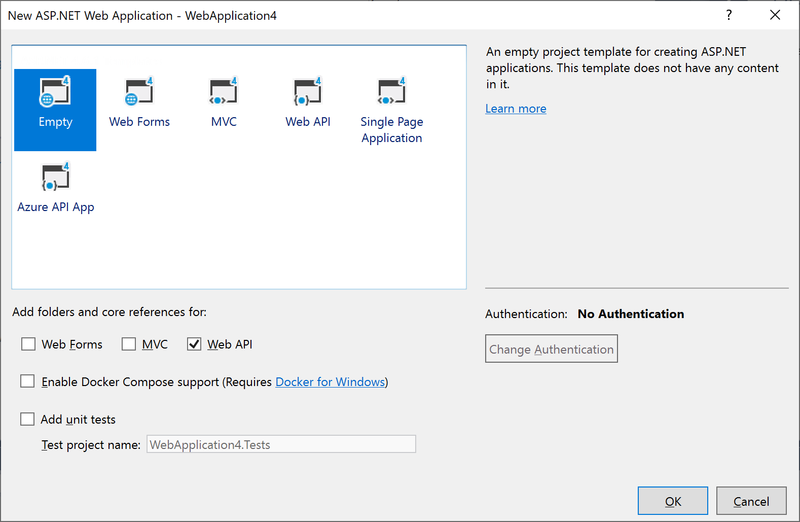 In the New ASP.NET Web Application dialog box, select the Empty project template. Under Add folders and core references for, select the Web API checkbox. You can run the application locally or deploy to Azure. 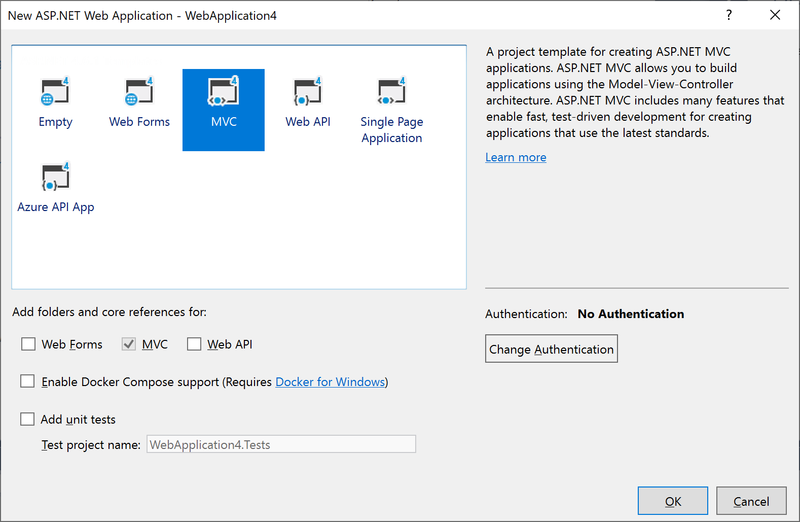 (For the screenshots in this tutorial, the app deploys to Azure App Service Web Apps.) To verify that the web API is working, navigate to http://hostname/api/test/, where hostname is the domain where you deployed the application. You should see the response text, "GET: Test Message". 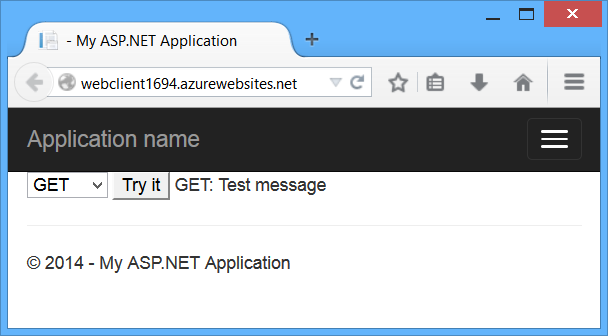 Create another ASP.NET Web Application (.NET Framework) project and select the MVC project template. Optionally, select Change Authentication > No Authentication. You don't need authentication for this tutorial. For the serviceUrl variable, use the URI of the WebService app. Run the WebClient app locally or publish it to another website. When you click the "Try It" button, an AJAX request is submitted to the WebService app using the HTTP method listed in the dropdown box (GET, POST, or PUT). This lets you examine different cross-origin requests. Currently, the WebService app does not support CORS, so if you click the button you'll get an error. If you watch the HTTP traffic in a tool like Fiddler, you'll see that the browser does send the GET request, and the request succeeds, but the AJAX call returns an error. It's important to understand that same-origin policy does not prevent the browser from sending the request. Instead, it prevents the application from seeing the response. This command installs the latest package and updates all dependencies, including the core Web API libraries. Use the -Version flag to target a specific version. The CORS package requires Web API 2.0 or later. For the origins parameter, use the URI where you deployed the WebClient application. This allows cross-origin requests from WebClient, while still disallowing all other cross-domain requests. Later, I'll describe the parameters for [EnableCors] in more detail. Do not include a forward slash at the end of the origins URL. Redeploy the updated WebService application. You don't need to update WebClient. Now the AJAX request from WebClient should succeed. The GET, PUT, and POST methods are all allowed. This section describes what happens in a CORS request, at the level of the HTTP messages. It's important to understand how CORS works, so that you can configure the [EnableCors] attribute correctly and troubleshoot if things don't work as you expect. Here is an example of a cross-origin request. The "Origin" header gives the domain of the site that is making the request. If the server allows the request, it sets the Access-Control-Allow-Origin header. The value of this header either matches the Origin header, or is the wildcard value "*", meaning that any origin is allowed. If the response does not include the Access-Control-Allow-Origin header, the AJAX request fails. Specifically, the browser disallows the request. Even if the server returns a successful response, the browser does not make the response available to the client application. For some CORS requests, the browser sends an additional request, called a "preflight request", before it sends the actual request for the resource. The rule about request headers applies to headers that the application sets by calling setRequestHeader on the XMLHttpRequest object. (The CORS specification calls these "author request headers".) The rule does not apply to headers the browser can set, such as User-Agent, Host, or Content-Length. Access-Control-Request-Method: The HTTP method that will be used for the actual request. The response includes an Access-Control-Allow-Methods header that lists the allowed methods, and optionally an Access-Control-Allow-Headers header, which lists the allowed headers. If the preflight request succeeds, the browser sends the actual request, as described earlier. Tools commonly used to test endpoints with preflight OPTIONS requests (for example, Fiddler and Postman) don't send the required OPTIONS headers by default. Confirm that the Access-Control-Request-Method and Access-Control-Request-Headers headers are sent with the request and that OPTIONS headers reach the app through IIS. The removal of OPTIONSVerbHandler prevents IIS from handling OPTIONS requests. The replacement of ExtensionlessUrlHandler-Integrated-4.0 allows OPTIONS requests to reach the app because the default module registration only allows GET, HEAD, POST, and DEBUG requests with extensionless URLs. You can enable CORS per action, per controller, or globally for all Web API controllers in your application. To enable CORS for a single action, set the [EnableCors] attribute on the action method. The following example enables CORS for the GetItem method only. If you set [EnableCors] on the controller class, it applies to all the actions on the controller. To disable CORS for an action, add the [DisableCors] attribute to the action. The following example enables CORS for every method except PutItem. The origins parameter of the [EnableCors] attribute specifies which origins are allowed to access the resource. The value is a comma-separated list of the allowed origins. You can also use the wildcard value "*" to allow requests from any origins. Consider carefully before allowing requests from any origin. It means that literally any website can make AJAX calls to your web API. The methods parameter of the [EnableCors] attribute specifies which HTTP methods are allowed to access the resource. To allow all methods, use the wildcard value "*". The following example allows only GET and POST requests. However, browsers are not entirely consistent in how they set Access-Control-Request-Headers. For example, Chrome currently includes "origin". FireFox does not include standard headers such as "Accept", even when the application sets them in script. If you set headers to anything other than "*", you should include at least "accept", "content-type", and "origin", plus any custom headers that you want to support. The CORS spec calls these simple response headers. To make other headers available to the application, set the exposedHeaders parameter of [EnableCors]. In the following example, the controller's Get method sets a custom header named ‘X-Custom-Header'. By default, the browser will not expose this header in a cross-origin request. To make the header available, include ‘X-Custom-Header' in exposedHeaders. Credentials require special handling in a CORS request. By default, the browser does not send any credentials with a cross-origin request. Credentials include cookies as well as HTTP authentication schemes. To send credentials with a cross-origin request, the client must set XMLHttpRequest.withCredentials to true. If this property is true, the HTTP response will include an Access-Control-Allow-Credentials header. This header tells the browser that the server allows credentials for a cross-origin request. If the browser sends credentials, but the response does not include a valid Access-Control-Allow-Credentials header, the browser will not expose the response to the application, and the AJAX request fails. Be careful about setting SupportsCredentials to true, because it means a website at another domain can send a logged-in user's credentials to your Web API on the user's behalf, without the user being aware. The CORS spec also states that setting origins to "*" is invalid if SupportsCredentials is true. The [EnableCors] attribute implements the ICorsPolicyProvider interface. You can provide your own implementation by creating a class that derives from Attribute and implements ICorsPolicyProvider. // Create a CORS policy. Now you can apply the attribute any place that you would put [EnableCors]. For example, a custom CORS policy provider could read the settings from a configuration file. As an alternative to using attributes, you can register an ICorsPolicyProviderFactory object that creates ICorsPolicyProvider objects. The Web API CORS package is a server-side technology. The user's browser also needs to support CORS. Fortunately, the current versions of all major browsers include support for CORS.